A flaky, tender crust... cinnamon-y apple filling... Pie, right? Well, kind of. The ingredients are all pie; but the pan is rectangular, rather than round. The result? 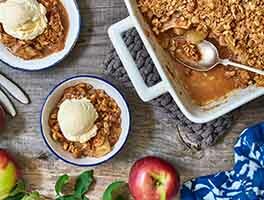 An ideal "apple pie" for potlucks and other occasions when you want a larger number of smaller servings. 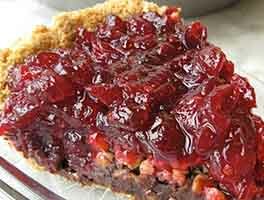 You can easily cut this pie into 12 to 16 servings - try THAT with a typical 9" pie! 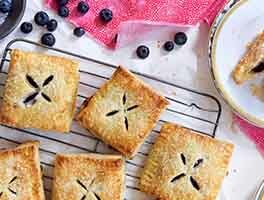 Note: While we like the crust below, you can certainly use your favorite pie crust for this dish. Just make sure it calls for 2 1/2 to 3 cups of flour, to ensure you have enough crust for this size pan. 1 hrs 55 mins. to 9 hrs 50 mins. *Substitute 1/3 cup honey, if desired; or 1/4 cup thawed frozen apple juice concentrate, or maple syrup. To make the crust: Whisk together the Perfect Pastry Blend or flour, salt, baking powder, confectioners' sugar, and buttermilk powder. Add the shortening, working it in until the mixture is evenly crumbly. 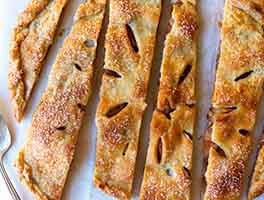 Shape each piece of crust into a rectangle; you're going to be rolling them into rectangles, so might as well give yourself a head start. Cover with plastic wrap, and refrigerate for 30 to 60 minutes, until thoroughly chilled. Put the crust in the fridge while you get the apples ready. Start preheating your oven to 350°F. Spread the bread crumbs or crushed cornflakes evenly over the crust. Sprinkle the cinnamon-sugar over the apples. Just before baking, slash the crust 6 or 8 times to allow steam to escape. 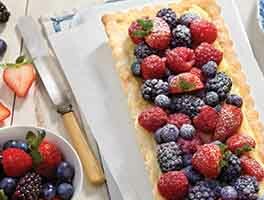 If desired, brush the crust with milk or cream, and sprinkle with coarse white sparkling sugar. Bake the slab for an hour; it'll be golden brown, and the filling should be bubbling. Remove it from the oven, and allow it to cool a bit before serving. If you choose to add the glaze, let it cool completely. To make the glaze: Combine the confectioners' sugar, boiled cider, cinnamon, salt, and enough milk or cream (if necessary) to make the mixture "drizzlable." Don't have boiled cider? Use plain milk or cream, maple syrup, honey, or thawed apple juice concentrate. Start with 1/4 cup of any of these; if you've made this kind of icing before, you know it's easier to add more liquid, than to try to take it away. Add enough liquid to make the glaze pourable. To make your own cinnamon-sugar: Mix 2/3 cup granulated sugar and 1 tablespoon + 2 teaspoons ground cinnamon. I love this pie! I've made it a few times in the past and it always comes out great! I tried this recipe on Saturday, fresh from picking stayman winesaps. The finished product -- despite my somewhat botching of the top crust -- is SO good. I am definitely making it again. I didn't have the buttermilk powder, and for the glaze just used confectioners' sugar and cider. Another superb recipe from KAF! I wanted to bring a pie to a fall potluck and this recipe was perfect. I did make a couple of adjustments. I used my own tried and true crust. And I didn't have panko, so I took a shot and used ground cheerios instead. I sprinkled the layer with a little cinnamon. I also used two tbsp of instant clear gel with the apples because I was working with Cortlands and feared they would be too juicy. I used apple cider and a little maple syrup for the glaze. The final result was perfect. I served it only two hours out of the oven, and it sliced like a dream. Perfection! This is an excellent recipe! I omitted the confectioners sugar and buttermilk powder for the pie crust. I had to roll out the pie dough very thinly, but thankfully it held together. I rested the bottom crust in the freezer for about 20 minutes since I had to handle it a little more than I should have. I also used crushed Kashi multigrain cereal flakes instead of panko since that was what I had in my pantry. For the filling, I included about a quarter cup of KAF's boiled cider, since I opted no to make the glaze. Finally for the top crust, I crimped the border using the rounded side of a 1/2 teaspoon because I couldn't crimp it the normal way for a round pie, and then I used an egg wash and topped it with sparkling sugar. I baked the pie for about an hour and 15 minutes. It was not only gorgeously golden brown, it was delicious too! 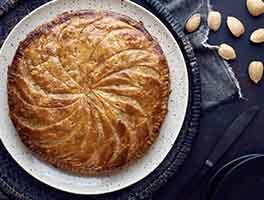 I posted a photo of the finished pie on Instagram and tagged it to KAFrecipes. Found the inclusion of panko...odd. I used 1/2 cup of KA pie filling enhancer instead. Wonderful pie and great crust. The crust was a bit challenging, but I used Kerry's waxed paper technique and it worked very well. I used mostly whole wheat pastry flour along with some of the perfect pastry, and left a lot of chunks of butter visible in the dough and it was delicious. I made the glaze exactly as the recipe and it was scrumptious! Will definitely make again. This is our favorite apple pie recipe and has been for several years! I always use reduced apple cider in the filling and the early Ginger Gold apples make the best apple slab ever! Just bought a bag of them to make this recipe with.